Future Fashion Now made its debut at the Audi Fashion Festival and exposed emerging designers from around the world, including Singaporean ones like Mae Pang and Max Tan. Also a little birdie told me that in a few months time, some more Singaporean designers’ collections will be added on the site for pre-ordering. What this site is doing for these designers is raising their profile and making it convenient for people to find them and get their hands on some of their designs, wherever they are in the world. A much-needed step to promote these emerging talents and get them noticed internationally. Of course this makes the wait longer but is it worth it? Having seen the excellent selection of designers and some of the pieces at Blueprint tradeshow, I have to say I was more impressed than I thought I would be. The pieces are totally covetable and because they’re exclusive - in many cases they’re worth hanging on for a few months to get hold of. So if you’re planning on investing in a piece which you’d cherish forever, here are my picks of the best from the local and Asian designers’ new collections available straight to your door. Simple, sophisticated but not boring. This is a perfect dress for an occasion or a night out with friends. Love the fabric and the neck detail. It also happens to be the same dress that caught my eye on the catwalk during the alldressedup show at AFF. Max Tan’s collection was the most unusual especially if you’re familiar with his draped style and use of dark colours. I don’t think I would personally be able to pull off any of his latest pieces but I absolutely love this corset and pants/skirt hybrid combo which looks out of this world. I remember spotting it at Blueprint and I couldn’t resist touching it everytime I walked past. All I can say is, kudos for those who decide to give it a try. It is something worth waiting for because you know you’re going to instantly stand out wearing it. It’s not really leather jacket weather in Singapore and that’s exactly why this leather cape/jacket is perfect for when it’s s little chilly. With no sleeves and dramatic cutting, it’s worth the investment and would take any LBD or outfit to a much edgier level in an instant. Just love it! Mae is one of the few Singapore designers whose style is instantly recognizable, with the use of geometric patterns, interesting fabric mixes and colours. I’m absolutely in love with her new collection that although lacking the colour explosion of older seasons, still manages to look as bold and interesting. I love this jacket/skirt combo with contrasting textures, perfect to mix and match with chunky jewellery and prints. 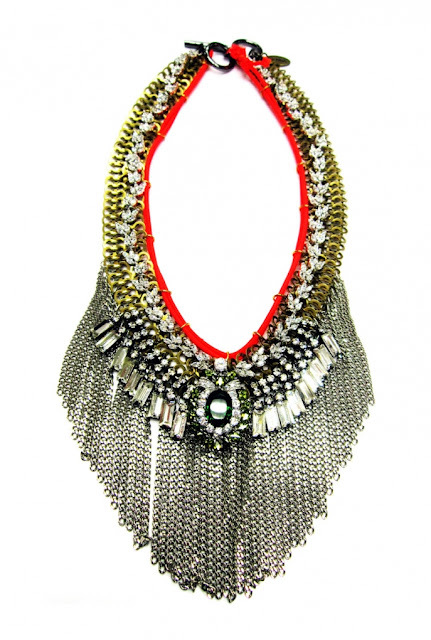 It’s really hard to pick just one of these beautiful statement necklaces by Hong Kong-based label, Venna. 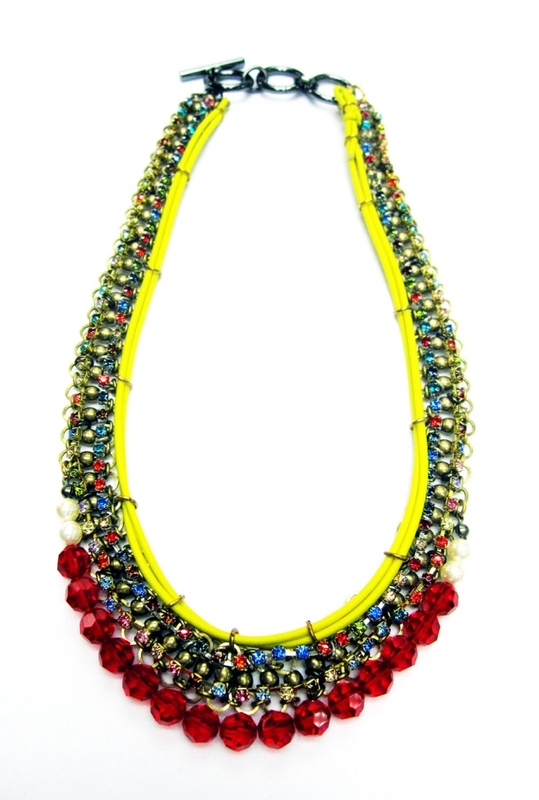 I love the chunky yet elegant style with colours and Swarovski crystals which are fresh and a bit more cheerful than the usual. 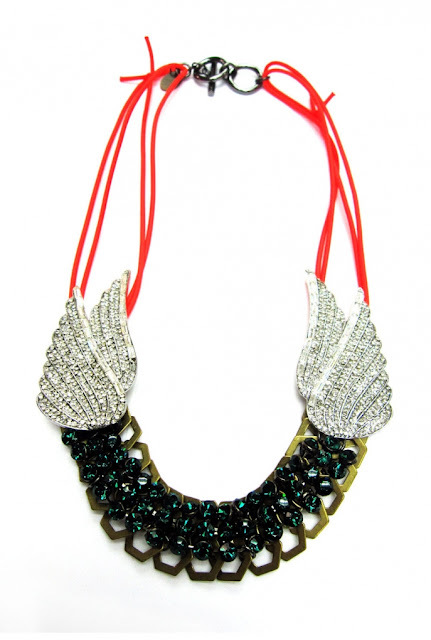 These necklaces would dress up any plain outfit and instantly put you on any best dressed list. This Korean born designer is another label that stood out at Blueprint and it just missed the cut from my picks of the show. Luckily I knew I wouldn’t be conflicted when I could include it on an FFN post. This particular gorgeous dress (in yellow colour) blew me away. Sophisticated and fresh, I love the demure style and the luxe embroided georgette material (which by the way was big feature this Summer especially in the Louis Vuitton collection) and workmanship on this piece. I am totally in love with it and it is definitely on my birthday wish list! Note: Window for pre-ordering the featured pieces closes on the 19th of June. Go to futurefashionnow.com to check the collections out.